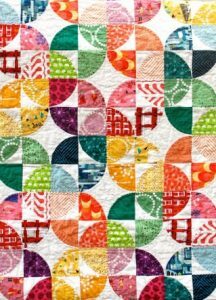 When my sister and I go on our travels which has lately taken the form of a cruise, I always prepare a couple of kits of patchwork hand-sewing projects. This year we will be visiting the Caribbean for a fly-cruise so will have to reign back slightly on our packing. After consultation with Catherine, we decided to tackle the Drunkards’ Path block. After browsing various Pinterest boards I came up with two very different arrangements for the blocks. 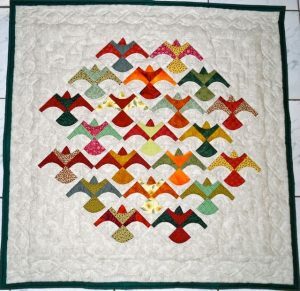 The first, ‘Drunken Birds’, I will be stitching myself, whilst Catherine will be working on a slightly more traditional arrangement. We decided that as we would be in the Caribbean we would choose vibrant coloured fabrics to reflect our location. 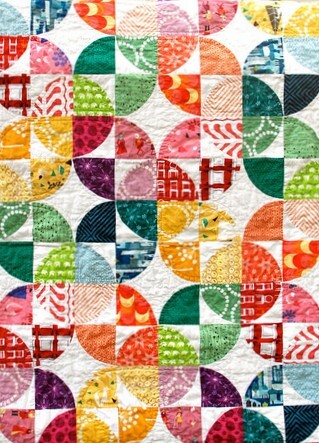 I visited New Threads Quilt Shop and purchased twelve fat quarters which combined with some equally bold prints would be used in our projects. The background colour for my quilt will be Blue and Catherine has chosen a Primrose Yellow. according to the inspiration to check how they looked together. 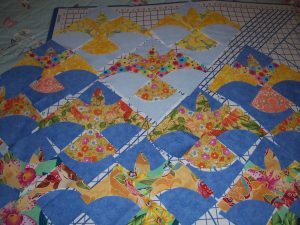 I have used three different shades of Blue for the background ‘sky’ and arranged the blocks so that the lightest ‘sky’ is at the top of the quilt, grading to a medium Blue and then for the bottom row of birds, a much darker Blue. 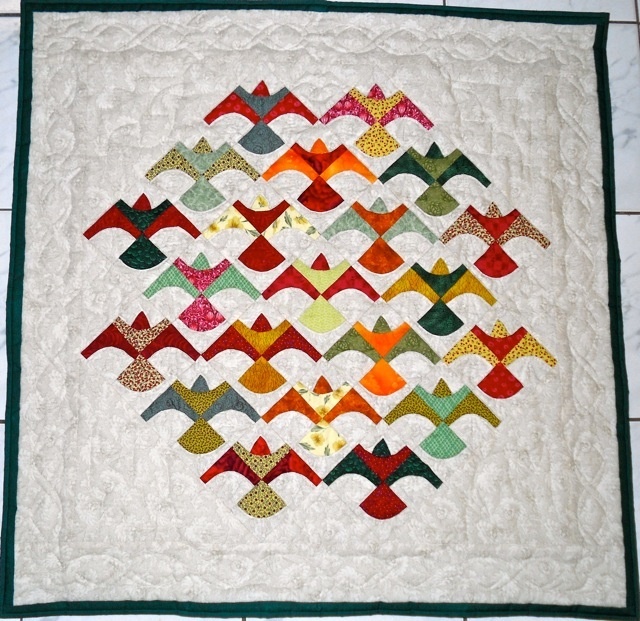 I hope that this will help to give the impression of perspective, that the top row of birds are further away. We shall see. 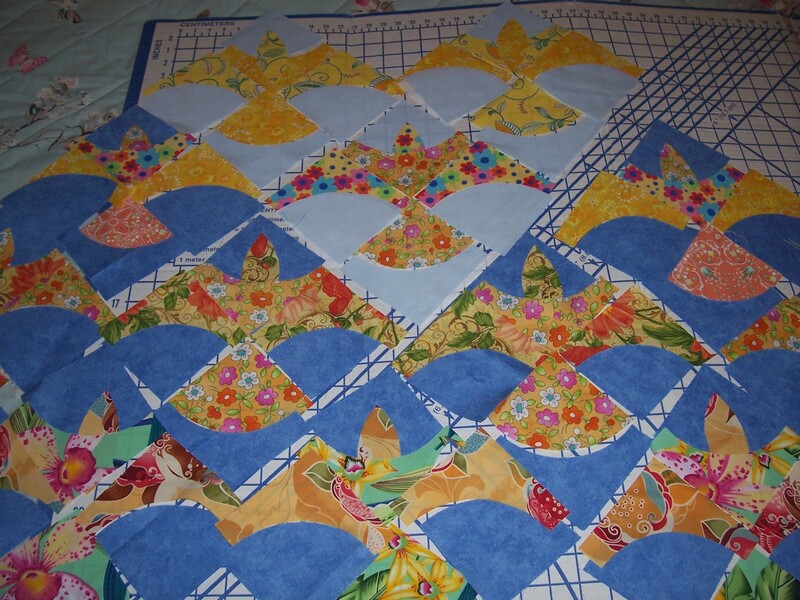 I cut the lozenge shapes in half widthways and placed on the appropriate Blue fan-shaped piece before using a fine zig-zag stitch to appliqué in place. Gradually all the ‘heads’ were stitched. 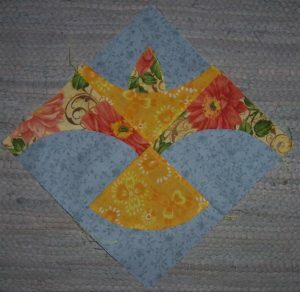 Well, now I thought I would stitch a sample/test block. I was so pleased with the result that I could not stop…. now I have stitched seven blocks on the machine. 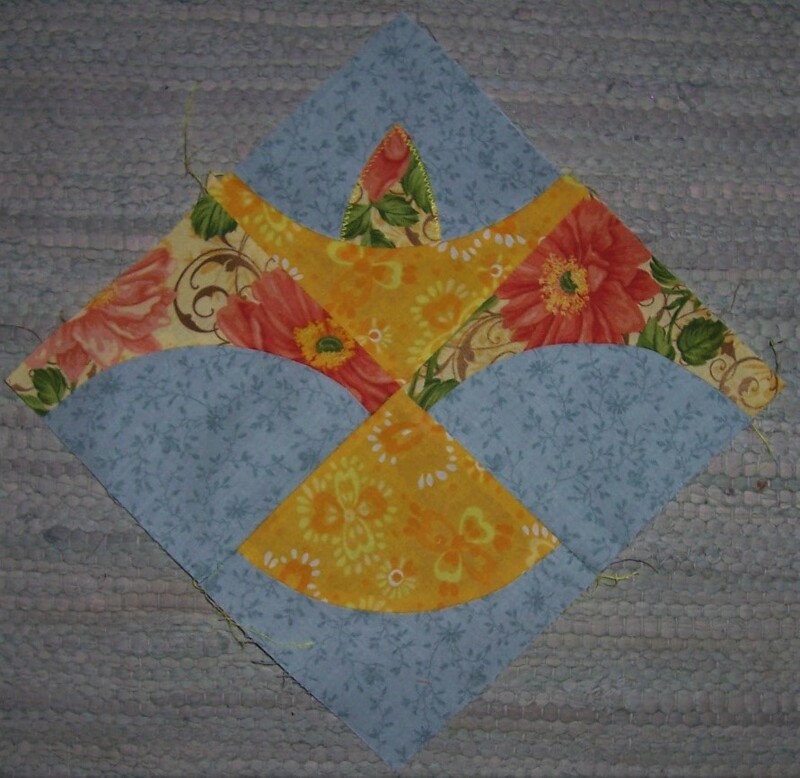 This means that I shall have to make all 21 of the blocks on the machine as otherwise with some hand-sewn the result on the quilt may look a little odd. I don’t mind. I enjoy stitching this block and as Catherine has in excess of 100 blocks to sew for her quilt I will happily assist by hand stitching some for her. What are sisters for?